Not only have students from Wiley College, including the Nate Parker Scholars, as well as Students from predominantly white East Texas Baptist University, taken on the responsibility of helping us maintain Love Cemetery, but, in 2008, Wiley faculty member Lisa Taylor invited me to work with her. We drafted plans for a national pilot project in education called “Writing History.” As part of that initiative, we’ve been hosting a series of ongoing community-faculty meetings in Marshall, Texas, after Love Cemetery cleanups. 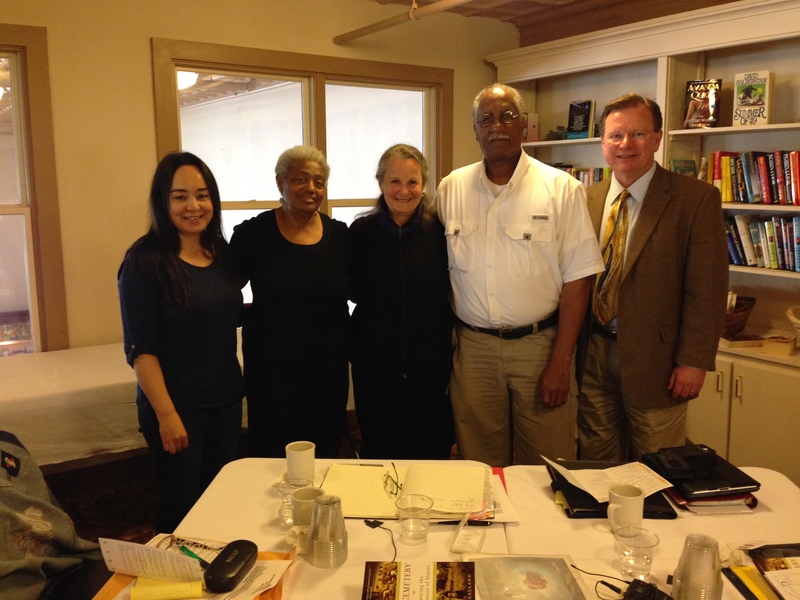 The photograph below is from our most recent meeting, Monday, April 7, 2014. Rev. Estrus Tucker, who took the photo and facilitated our meeting, is also a member of our Resurrecting Love documentary Advisory Board. Tucker is an international consultant, speaker, storyteller, poet and master facilitator who is on the Board of the Winter Institute for Racial Reconciliation at University of Mississippi, the International Association of Human Rights Agencies Board, the National Center for Courage and Renewal Board; a Vietnam-era veteran; the 2012 recipient of the International Association of Human Rights Agencies Individual Achievement Award “for his work and leadership in support of creative civic engagement and transformational leadership in Mississippi; Belfast, Northern Ireland; Cape Town, South Africa, and Texas. Tucker, from Fort Worth, Texas, has three generations of family who were born, lived, and died and are buried in the Marshall, Texas, area. Wiley Debate coach Chris Medina, who was also unable to attend, helped me draft a resolution which Wiley then debated with Morehouse, Emory, and Harvard in private exhibition debates, 2012. See one of Wiley’s debate champions giving her prize-winning speech on Love in Love Cemetery, March 2013.